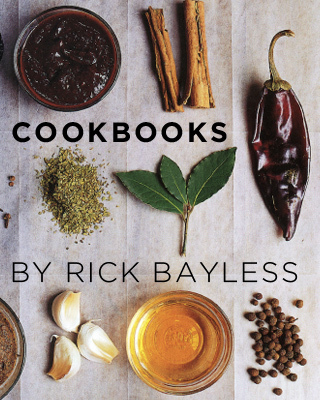 This recipe is from Rick's first cookbook, Authentic Mexican. Cut a 1/2-inch slice off both ends of the prickly pears, then make a 1/2-inch-deep incision down one side, end to end. Carefully (remember, there are little stickers) peel off the rind, starting from your incision: The rind is thick and, if ripe, will easily peel away from the central core of fruit. Roughly chop the peeled prickly pears. Place the fruit in a blender or food processor, add 1 cup water, the sugar and lime juice, and blend for several minutes, until the sugar is dissolved. Strain through a medium-mesh sieve; taste for sweetness and tartness, adding more sugar or lime juice as necessary. If time permits, chill thoroughly. Pour the mixture into the canister of your ice cream freezer and freeze according to the manufacturer’s directions. When the ice comes from the machine, it may be rather soft; for a firmer texture, let it "ripen" in your freezer for a couple of hours before serving. Peel, pit and/or seed about 2 pounds (slightly more for cantaloupe) fruit, to yield 2 cups of fruit pulp. Puree with 1 1/2 cups water, 3/4 to 1 cup sugar, and lime juice to taste. Freeze according to the manufacturer’s directions. A tablespoon or so of dark rum is delicious addition. Puree 2 1/2 cups of packed-down fruit (hulled and halved strawberries, peeled and diced kiwi) with 1 cup water, 3/4 to 1 cup sugar and about 2 1/2 tablespoons fresh lime juice. Freeze according to the manufacturer’s directions. A tablespoon or so of Triple Sec or Cointreau are good additions.